Indians Baseball Cards: Manny can be "Manny" somewhere else, thanks. Manny can be "Manny" somewhere else, thanks. Remember this guy? This was the up-and-comer, Manny Ramirez, back around 1992. He was one of the leading prospects for the Tribe's rebuilding phase. And, boy did he help rebuild the Tribe! Man, the Indians were smokin' in those days (well, the ones following anyway). And, so it is that 17 years later, a young boy posed the question to Mark Shapiro, "Could you sign Manny?" To which Shapiro replied, "COULD I or WOULD I?" Frankly, I think the answer should be the same, regardless of the question. Yes, Manny is a top-notch player, one of the best players today. But, frankly, he belongs on the Yankees. Why? Because that team is chock full of players that are self-centered hot-shots who not only spell 'team' with an 'i,' they spell it with a very large UPPERCASE "I" at that. If the Tribe somehow managed to win some kind of lottery and decided to blow the one-time payout on ManRam, I would of course treat him like I do anyone wearing a Tribers uniform. But, I would do it while smiling between gnashed teeth. 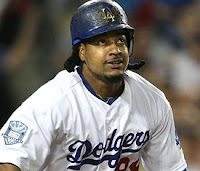 I used to be a huge Manny Ramirez fan. I am not a 'ManRam'/'Manny being Manny' fan. I agreee 100%. We could use his bat but I would be very fearful of a long term contract and the Mr. Goodguy image in Dodger land is not going to last ! I can't help it. I'd take him back in a second and hate myself in the morning. I don't think I ever enjoyed watching anyone hit as much as I enjoyed watching Manny when he was with the Tribe. By the way, considering your recent surgery, you should try to avoid any gnashing of the teeth. At least for a few weeks. Doctor's orders. I agree with you. Manny is a timebomb waiting to go off and shred any team he is playing for. The best things for baseball would be for him to go unsigned this year. Of course expecting that out of the owners would be like expecting Manny to be a team player. Sorry - can't let this go. Who are the self-centered hot-shots on the Yankees you are complaining about? I enjoy your blog, but as a Yankee fan I find that kind of remark distasteful. As an Indian fan, you should save your hate for the White Sox and other teams in your division. On the topic of Manny, how come no one ever links him to steroids? The prime evidence in most peoples minds for people like Bonds, McGwire and Clemens is their size on their old baseball cards compared to today. But Manny was also pretty skinny when he was with Cleveland, compared to his hulking presence now. Night Owl cards in the mail! Jusss call me Dr. Doofensmirtz, okay? I beat my record by 9 days! More "12 Days" packs are heading out! Getting back "in the loop"
Catching up on gifts *TO* Tribecards!